Massa's battled against Kobayashi was a lot closer than we'd anticipated, as has a lot of this first round been. It seems as though we're getting to know the character of the drivers much more than in 2009, as quite often people can't decide where to place their votes. 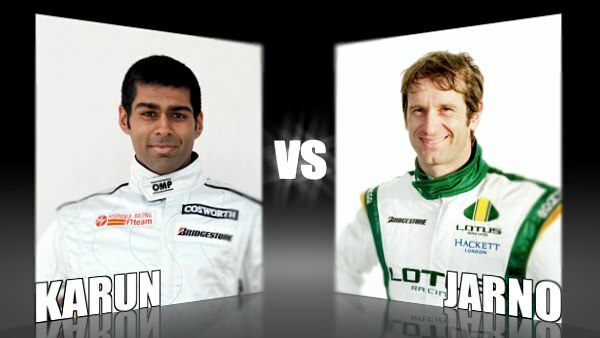 Let's see how it goes with this pairing though, the temporarily ousted Karun Chandhok, and the ever-resiliant Jarno Trulli. It's fair to say that Karun has taken the paddock by storm, and made a good impression on fans whilst he was at it. From the basic stuff like being smiley in interviews, to the more awesome Twitter posts, he's certainly garnered lots of followers along the way. Just like Senna had to last race, Chandhok will be sitting out this Grand Prix weekend in Germany. He doesn't appear to have let it get him down though. Now, admittedly, Trulli isn't always in a good mood, but the swings and roundabouts we go through with the Italian just add to his character. Who didn't love the time he brought out photographic evidence against Sutil in the press conference? I can't imagine anyone else doing that but Mr Trulli. We've covered recently how he sometimes is too grumpy to sign things for fans, but Mr C and I spotted him signing autographs first thing in the morning, so mileage may vary!